Dual Guineas winner Gleneagles had little more than an exercise gallop to win today's Group One St James's Palace Stakes. He won by two and a half lengths and half a length from Latharnach and Consort, although it was disappointing that French Guineas winner Make Believe ran below par and finished last of the five runners. 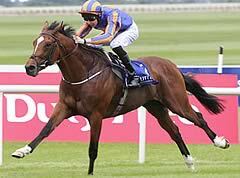 On today's evidence Gleneagles is the best three-year-old miler in Europe. The winner was ridden by Ryan Moore, who has become no.1 jockey at the Ballydoyle Stables of trainer Aidan O'Brien, although the former first-choice, O'Brien's son Joseph, remains a key player in Gleneagles' career, and rides him every day. Aidan said: "Joseph said before the race that he had him better today than at any stage, which was pleasing to hear. He does everything with the horse and he wouldn't say that lightly. "He had him very well at Newmarket for the Guineas, but we couldn't train him real hard for the Curragh, so just ticked him over and then revved him up today. He gets a bit hot before he runs and is a warm-blooded horse, but he takes everything in his stride. "He's very like Giants Causeway in that he's got the same constitution, but he has more speed. You rode Giants Causeway near the pace and would grind it out, but this horse can relax and quicken. I don't think we've had a miler as good as him. As a two-year-old he was never going to get up the ratings because he only would only do the minimum - today I was surprised he won by two and a half lengths. "If it was lovely ground at Goodwood you would want to see him run there [against older milers for the first time in the Qatar Sussex Stakes] and then he could run over ten furlongs if the lads decide that's what they want to do." This was O'Brien's seventh win in the St James's Palace Stakes, but he played down his role, saying: "I'm just a small part of a very big team, and privileged to be able to play a part. I'm getting older now and the younger lads are coming on. I'm watching more and going with the flow. I'm 45 now and it's great to see younger people coming along and taking responsiblity and the pressure. So many people make it happen. "I only look on - I just stand at the top of the gallops and watch the work, which is good for me, and a lot less pressure." Latharnach, who finished two and a half lengths behind Gleneagles, was having his second start of the season after finishing runner-up in a Listed race at Newmarket on May 16. His trainer Charlie Appleby said: "We're delighted. We set our stall out that we'd sit out the back and let the race unfold in front of us. Today was a learning curve about what level we can step up to. He saw out the mile well there and he's obviously shown a good level of ability, so he's got an array of options. "We'll let the horse come out of the race and see where we are. When you finish second behind a horse who has won two Guineas [Gleneagles], I'll be happy enough to say that we'll be confident in taking our chances in a Group One again, for sure. It would be an easier route if we could avoid Gleneagles, though." Latharnach's jockey William Buick said: "We always thought a lot of him. He needed his first run at Newmarket and that was a great run coming back there. He battled and he is up against Gleneagles, who is in a different class, but he was a good second." Harry Herbert, manager of Highclere Thoroughbred Racing, who own third-placed Consort, trained by Sir Michael Stoute, said: "I'm absolutely thrilled. As Frankie [Dettori, who rode Consort] said, it wasn't quite the plan - we thought we'd get a lead from the French horse [Make Believe], but we're over the moon, it's a terrific effort, even if we're a bit frustrated to be run out of it close home for second. "For an inexperienced horse it was a terrific run, and Frankie said he's a really lovely horse and there's so much more improvement to come. He's not there physically yet and it was a tough ask for a horse who has only had two runs previously to have to be in front with that sort of opposition. We know we've got one to go to war with. "Sir Michael says his instinct tells him to just back off the horse, so we may give him a bit of time off. His future is all ahead of him. It's such a thrill to come here with a syndicate-owned horse and run so well in a Group One." Dettori said: "He has done really well. He took the step up in class well and he just lacked the mileage on his clock. He needs a bit more experience, but he is a super horse."